The marine protected area (MPA) of Arrábida was created in 1998 and implemented in 2005. It was named after the famous Portuguese marine biologist Luiz Saldanha (1937-1997), who dedicated his career to studying this region. The MPA covers about 5300 hectares, with varying depths of up to 100 meters. It spans from the beach Praia da Figueirinha southwest of the city of Setúbal to Cape Espichel and Praia da Foz. 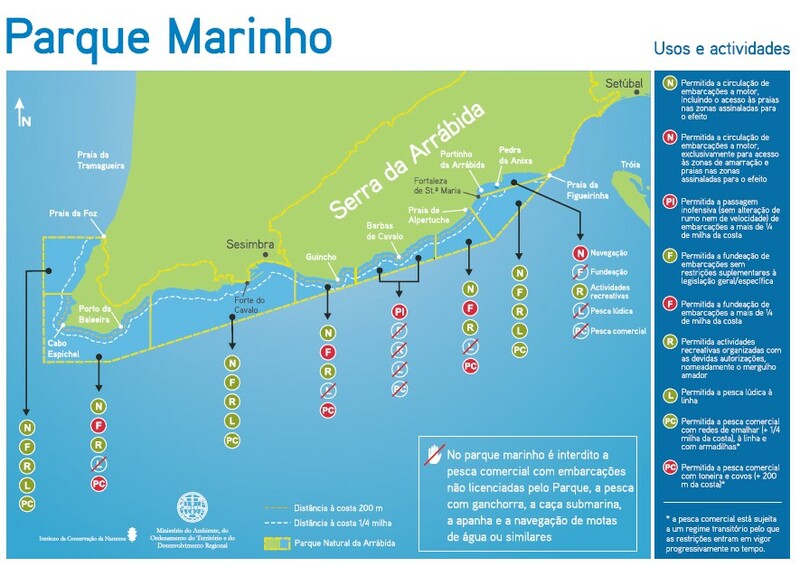 This MPA is divided into eight zones with varying regulations, from a fully protected zone where no activities are allowed to partially protected zones, where large commercial fishing operations are prohibited but sustainable artisanal fishing is allowed and regulated. The marine park is home to over 1500 marine animal and plant species, making its natural richness unique at a European level. The area is sheltered by the surrounding Arrábida Mountains from winds, which minimizes wave exposure. This sheltered environment favours the breeding of many different species, as it gives the juveniles of marine animals a protected area to develop. In this marine protected area, we can find various habitats, from rocky reefs, kelp forests, sea grass beds and sand banks. The rocky reefs are where most biodiversity is concentrated and where important commercial species, such as the white sea bream (Diplodus sagrus) and the common octopus (Octopus vulgaris), make their home. The kelp forests are also very valuable as they provide shelter and feeding grounds for many species. Deeper down, below 60 meters, corals and sponges dominate, forming complex habitats attracting a variety of flora and fauna. This MPA was established in order to protect the unique habitats and species but also to bring sustainability to the socio-economical activities that have been ongoing here through history, namely fishing. Arrábida is the perfect place to explore while enjoying one of the best that it has to offer – the beaches! All along the park there are beautiful sandy beaches, some with easier access than others. Praia do Ribeiro do Cavalo is a 20min hike near Sesimbra down a little dirt trail, but who makes the effort will be rewarded with a pristine beach with crystal clear water. The hard access also makes it less crowded, but you better wear good shoes and bring plenty of water! The beaches get quite crowded during the hottest months of the year, so make sure you get a head-start; get out of bed early and pack your swim suit and snorkelling gear. Indeed, getting wet is the best way to explore the underwater world of this MPA. In Portinho da Arrábida there are some rocks that make for great snorkelling. SCUBA divers can find dives from various diving schools in Sesimbra, Setúbal or Portinho da Arrábida. Yet, if you missed spotting some of the wildlife out in nature, you can learn about it in the Oceanographic museum at Portinho da Arrábida. This is the best way to learn about the unique features of the MPA without getting wet. In Portinho you can also arrange a boat trip and chances are high you will get a glimpse of the resident dolphins.